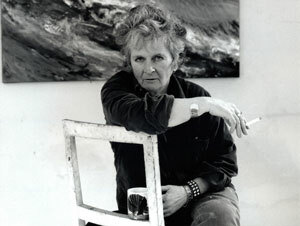 Maggi Hambling (born 23 October 1945) is a British painter and sculptor. Perhaps her best known public works are a memorial to Oscar Wilde in central London and Scallop, a 4 metre high steel sculpture of two interlocking scallop shells on Aldeburgh beach, dedicated to Benjamin Britten. Both works have proved controversial. Hambling studied at the East Anglian School of Painting from 1960 under Cedric Morris, then at Ipswich School of Art (1962–4), Camberwell (1964-7), and finally the Slade School of Art graduating in 1969. In 1980, Hambling became the first Artist in Residence at the National Gallery, London, during which she produced a series of portraits of the comedian Max Wall. Wall responded to Hambling's request to paint him with a note saying: "Re: painting little me, I am flattered indeed - what colour?" Hambling is well known as a portraitist with several works in the National Portrait Gallery, London . Her style tends towards the expressionistic, with some portraits completed during live sittings and others painted later, partly from memory. In the 1980s, she turned more to painting landscapes, most especially of the area around Suffolk where she lives. More recently her canvases have been more abstract, often including highlights of vivid colour, in particular her dramatic Seascapes of the North Sea. In 1995, she was award the Jerwood Painting Prize along with Patrick Caulfield and in the same year was also award an OBE for her services to painting.